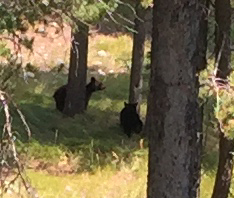 Baby bears were among the animals watched on the 2018 Grand Teton trip. 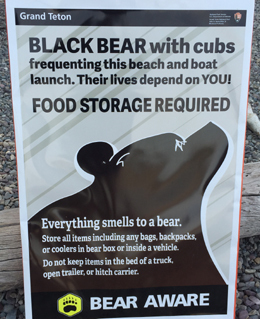 We had gone out to the usual places we have seen bears before, and found signs the Rangers put up warning people to not get too close, keep their food safe, etc. 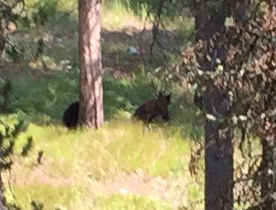 But it was not until our last morning that the bears came to us, very near the Colter Bay Village cabins. We got a chance to watch them for quite awhile. The two cubs played and wrestled with each other. One climbed part way up a tree and when the other one tried to climb it slid down. Then they went to a second tree and both tried again. 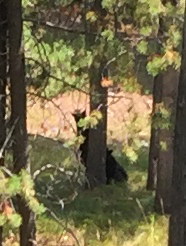 We were wondering where their mama was, as it is not good for people to get between a mama bear and her cubs, so watching from a good distance was in order. as the mama bear joined the two cubs and led them off. Yes, we were so busy enjoying them that we only took a few pictures with the cell phone. We were worried we would miss some of the fun they were having if we looked around for the better camera / telephoto. Next year you will get better pictures, okay? 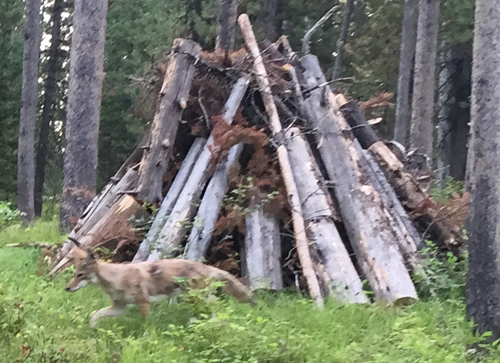 but we were able to point them out to new neighbors moving into their cabins next to us. 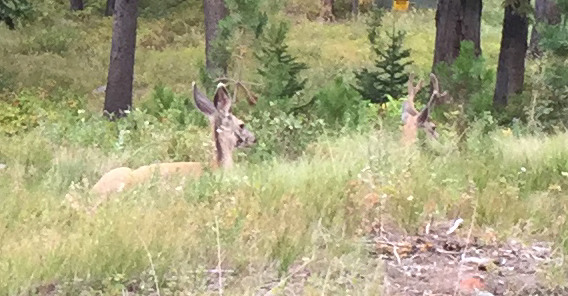 (They wanted to know if they were deer or elk and I explained that elk are much larger, with much bigger antlers). I got the families set up for a group photo on their cell phone with the deer beyond them (just before the deer decided to wander off). 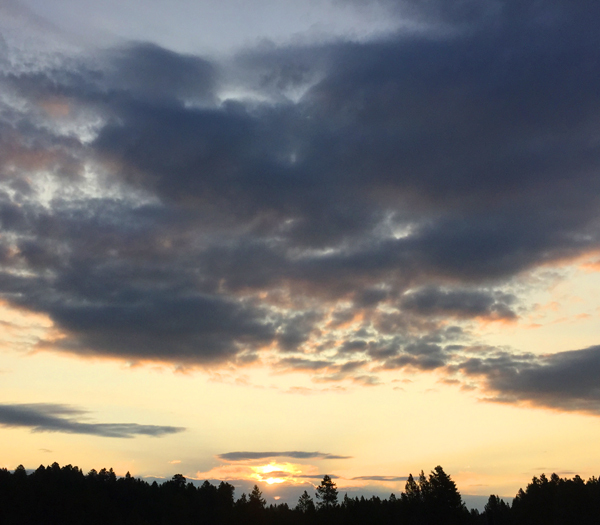 We did not get classic pictures of the bison, elk or pronghorns we watched, usually because they were in part blocked by trees, and/or we had pictures we liked from previous years and decided to not take any. 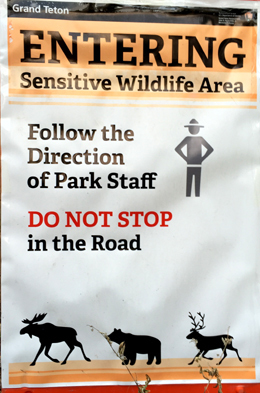 We did cause a small “animal jam” one morning as we watched a big male elk munching below the side of the road. 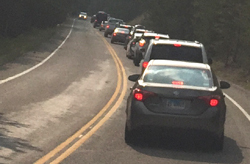 and we got stuck in a loooong line of cars, mostly not moving, in Yellowstone National Park for about 20 minutes when sooooo many people wanted to catch a glimpse of, or a long look at, a female elk in the river. Each morning we were out early we heard Sandhill Cranes, but did not see them dancing this year.